Once again, the administration has made clear that they do not believe that queer and trans people should be protected under the laws and policies that govern this nation. This is extremely dangerous for the trans community. Already, trans people are largely unprotected from discrimination in employment, housing, healthcare, education, and other resources necessary for survival. When legal protections are in place, they are often inaccessible by the trans community, especially those who are poor, rural, undocumented, and/or of color. for many trans folks, this changes little about their protection under law, but incites further violence and attacks against their existence. This erasure of trans people will only serve to put us more at risk. This is a continuation of willful acts by the current administration to exterminate transgender people through a government that has never existed to protect trans folks. As young transgender and non-binary people, we #WontBeErased. The work of generations before us, from Stonewall and before, have set the foundation for organizers to continue to fight (and to win) the equity and justice our community needs to survive. We will continue to build the resources our people need and we will never silence #OurTransTRUTH. Our stories will guide the work. We call on our community and those allied with our movement to show up. Research and understand what this memo could mean and then fight against it with everything you can. Gather and spread resources to support trans folks, from housing opportunities, job/gig openings, to mental and physical health support. Donate and support our GoFundMe’s. Hold our communities accountable to respecting and valuing the lives of the trans people who exist with us. 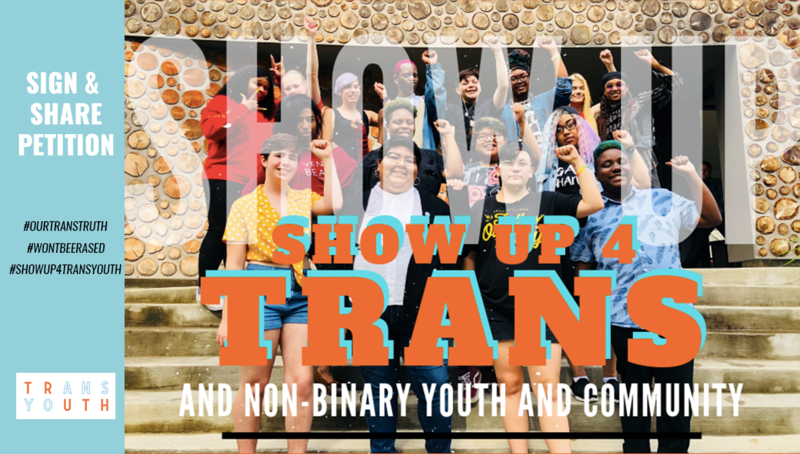 Sign on to our petition in solidarity with transgender, nonbinary, and/or GNC youth to commit to show up for us by supporting the trans community and taking action against transphobia. Share this petition to educate others on the affects of this memo on trans youth and uplift our response. While the government has been clear about their lack of commitment to the lives of queer and trans people, especially poor Black/brown queer/trans young people, we know we are on the right side of history and we will never stop fighting. Existing as queer and trans youth is getting more difficult every day. If you feel that you are unsafe or in need of support, please take a look at the attached resources and reach out as you feel able. You are not alone.